Gasco Energy Ltd, the leading operator responsible for storage and bottling of Liquified Petroleum Gas (LPG) in Malta, and the General Workers Union’s Chemical and Energy Section signed their first collective agreement for Gasco Energy employees for the three year period of 2014-2017. The collective agreement covers new work practices and will provide Gasco Energy’s employees with better salaries along the stipulated period. Agius Delicata thanked GWU Section Secretary Jason Deguara, GWU Shop Steward Lucian Pace, and GWU Assistant Shop Steward David Farrugia for bringing these collective discussions to a successful conclusion. 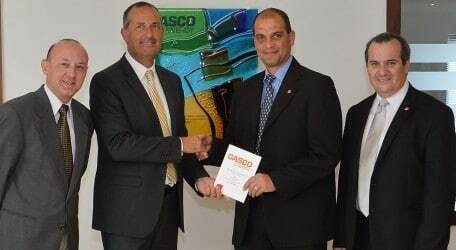 The signing of the collective agreement was witnessed by Gasco Energy’s Chief Financial Officer Stephen Muscat, and GWU Deputy Secretary General Josef Bugeja.